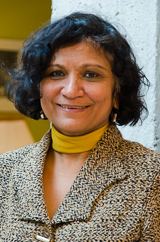 Associate Professor Nandini Ramanujam is the Executive Director and Director of Programs of the Centre for Human Rights and Legal Pluralism at McGill University's Faculty of Law. She also directs the International Human Rights Internship Program as well as Independent Human Rights Internships Program. She is the McGill representative for the Scholars at Risk Network and is a member of the Steering Committee of the Scholars at Risk Network, Canada section..
Nandini Ramanujam’s research and teaching interests include Law and Development, Institutions and Governance, Economic Justice, Food Security and Food Safety, the role of civil society and the Fourth Estate (Media) in promotion of the rule of law, as well as the exploration of interconnections between field based human rights work and theoretical discourses. Before joining the McGill Faculty of Law, Dr Ramanujam was involved in the successful systemic reform of higher education in the former communist countries of Eastern Europe and the Soviet Union, including Aga Khan’s Central Asian University and Smolny College in St. Petersburg. She has sat as Director of the Higher Education Support Program of the Open Society Institute in Budapest and Regional Director of Baltic and Eurasian Programs of Civic Education Project. She also has extensive experience in human rights issues, strategic planning, governance and programming, with a particular focus on education and civil society. She has been involved in the development of strategic planning for human rights institutions such as the Cambodian Centre for Human Rights and the Open Society Institute’s Disability and Law Network. She served on the Board of Directors of the Canadian Human Rights Foundation (Equitas) from 2001-2008, and was President of Board between 2003-2008. She is a member of the Board of Directors of Centraide of greater Montreal. Nandini Ramanujam received her Doctorate in Economics from Oxford University for her dissertation on Price Mechanism in Russia: Its role in the Old Planning and the New Markets. She holds a M.Phil and a M.A. in Economics with 1st class honours from Bhopal University. Rule of Law and Development, Critical Engagement with Discourses in Human Rights, Economic Justice, Comparative Perspectives on Corruption across Brazil, Russia, India and China, Role of Civil Society and the Fourth Estate (Media) in promotion of Rule of law, Exploration of interconnections between field based human rights work and theoretical discourses. With Nicholas Caivano and Alexander Agnello. "Distributive Justice and the Sustainable Development Goals: Delivering Agenda 2030 in India." Law and Development Review, Vol. 12, no. 2, 2019. With Sarah Berger-Richardson. "Ending child malnutrition under SDG2: the moral imperative for global solidarity and local action." Social Alternatives, Vol. 37, no. 1, 2018. With Nicholas Caivano and Semahagn Abebe. "From Justiciability to Justice: Realizing the Human Right to Food." JSDLP Online, Volume 11:1 (2015). With Siena Anstis. "Legal Empowerment, Social Movements and Fostering Equitable Economic Development in Cambodia" – Special Issue of Canadian Journal of Poverty and Law. Vol. 2 No. 1 (2013). Rule of Law and Economic Development: A Comparative Analysis of Approaches to Economic Development across BRIC Countries - https://mcgill.ca/roled/ (2012). Price Mechanism in Russia: Its role in the Old Planning and the New Markets – D.Phil Dissertation, Oxford University (1995). "Liberalization of Industrial System in China – A Review." In Development Experience in China and India, Editors, S.P. Gupta, Nicholas Stern, Athar Hussain, William Byrd, Indian Council for Research on International Economic Relations and London School of Economics, Allied Publishers Limited, 1991.